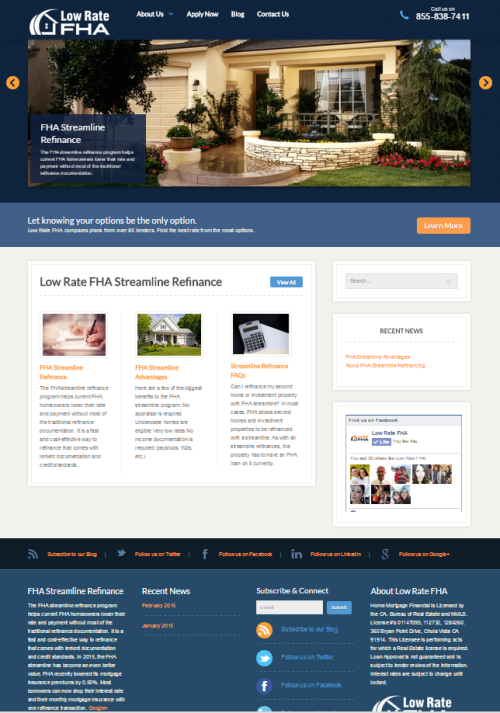 Pyxis Media Group recently completed a Pyxis Driven™ Website & Communication Platform for Low Rate FHA. Low Rate FHA now not only has a place to showcase everything about their services, but they also are able to easily share news. events and announcements. Their platform allows them to create a news post once, and it’s automatically shared not only on their website, but also with all of the major social media outlets, their eNewsletter, and RSS Feed. Low Rate FHA compares plans from over 85 lenders. Find the best rate from the most options. The FHA streamline refinance program helps current FHA homeowners lower their rate and payment without most of the traditional refinance documentation. It is a fast and cost-effective way to refinance that comes with lenient documentation and credit standards. In 2015, the FHA streamline has become an even better value. FHA recently lowered its mortgage insurance premiums by 0.50%. Most borrowers can now drop their interest rate and their monthly mortgage insurance with one refinance transaction.